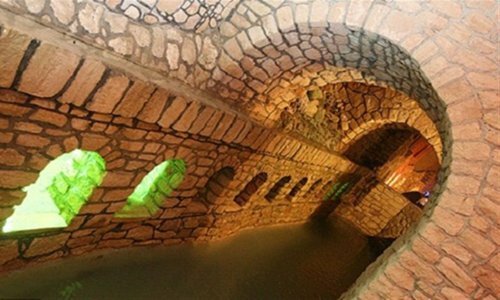 The first qanat (subterranean canal) museum of Iran and the world will open on February 20 concurrent with the first National Conference on Qanats, the Legacy of Water and Water on February 20-21, announced the executive secretary of the conference. Mohammad-Ali Behjati-Ardakani told Iran Daily that qanat was an Iranian innovation for channeling water along underground tunnels in the past. Each qanat is normally an almost horizontal tunnel for collecting water from an underground water source, usually an alluvial fan, into which a mother well is sunk to the appropriate level of the aquifer. The museum will feature the tools and instruments to make qanats as well as their pictures. The museum begins with Bahaeddin qanat in Ardakan city in the central province of Yazd which is very old and has long dried up so it has been turned into a tourism route, he said. The length of this qanat is 25 kilometers of which 600-700 meters are built below historical houses in Ardakan and underwent reconstruction and is ready for display. People can walk through the path and exit from another ‘Ab-Anbar’ (brick-lined water reservoir). By walking through the long and winding tunnels, people become familiar with the history of qanat, its significance and the difficulty of the people in the city to access water. Iran is one of the countries with several qanats and Yazd is world-known for its large number of qanats. The city of Ardakan alone has 230 qanats of which only six remain and the rest have dried up. Behjati-Ardakani pointed to tourism attractions of qanats and said those which are dried up due to low underground water resources have the potential to be used for tourism. Speaking about generating revenue from the qanats, he said over 7,000 tourists walked along these qanats during 15 days of Norouz (Persian New Year) vacations of last year and generated more than $4,750. Qanat is the symbol of water saving and congruency of people in cities at risk of water shortage with weather, he said, adding water consumption patterns specially in desert areas with an arid climate does not conform with water crisis there and they have the same consumption pattern as cities with sufficient water reservoirs. In the past, people used water from local qanats with sweet water for potable water and qanats with salty water for washing and agriculture, he said, elaborating on the differences between water used for washing and for drinking. The objectives of the conference are to find solutions to water shortage, particularly in cities in which water is running out and promote the culture of qanat.